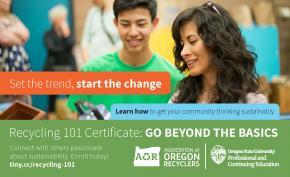 AOR is the resource for recycling and materials management in the state. People call us, looking for you. AOR's Sustainable Oregon Conference attracts hundreds of professionals who are deeply involved in the industry in Oregon and throughout the Northwest. Exhibiting at Sustainable Oregon offers an array of opportunities that provide your business or organization with a cost-effective way to promote your products and services. Come, exhibit at Sustainable Oregon 2019! Establish your brand, build new business relationships, secure your position as a leader in the industry, and support the growth of recycling and sustainable materials management in Oregon. The Exhibit Hall is the heart of the conference. Thursday breakfast and table topics, as well as all conference breaks and networking are scheduled in the exhibit hall to maximize your direct time with conference attendees. Our silent auction items are placed between exhibitor booths to increase foot traffic, and our lively fundraising activities always fill the room. In addition, our Wednesday evening hosted hospitality is held in the Exhibit Hall. Exhibit booths are $725 ($550 for nonprofits) and include one 8’ skirted table, 2 chairs, internet connection and 110-volt outlet at your booth, a full conference registration (which includes all meals & breaks and access to all sessions), and all conference materials, including attendee list. If you have questions about exhibiting, contact Patty Morgan, AOR's conference organizer.